The decision to sell your business, transfer it to another generation or continue to run it is often one of the hardest challenges any business owner confronts. Fox Three is your ideal partner if you're considering selling all, or a portion of your business; we understand your situation and will work with you to find an exit solution that meets your needs. ﻿﻿﻿Will I be dealt with fairly and honestly? Many potential acquirers make false promises to lure sellers further into the process, only to change their stance (and terms) at the last minute. We will always do what we said we were going to do... no "bait and switch" from us. Will my company's legacy be preserved? You've created a business and a brand. It's understandable that you want to see that brand continue. We do, too. We want owners to be proud to see their companies thriving 5-10 years after sale... with the same name. Will my employees be cared for? Many small business owners have deep relationships with their employees, and want to ensure they are treated fairly post-close. Businesses are made of people; Fox Three's mindset is to retain qualified employees to the maximum extent possible. What am I going to do when this is all done? You've worked hard to build your business; long nights, weekends, holidays. We often hear that business owners associate their identity with their business. We understand this, and will work with you to develop a plan that makes you feel comfortable with your exit. Whether that's remaining in the company in a leadership or other role, or being a strategic advisor or consultant, we are flexible as to your post-close involvement. 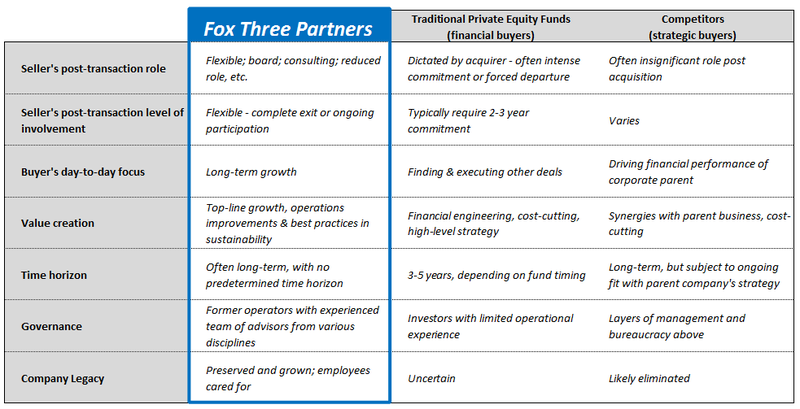 Why partner with Fox Three vs. other types of acquirers or buyers? ​Initial meeting with Fox Three. This can take place in-person or over the phone. Our goal in this meeting is to get to know the business owner and listen to their goals and desires with respect to a full or partial sale. If there is a mutual fit, we would move to Step 2. Sign Confidentiality Agreement; exchange information. You've worked hard to build your business. We always advise owners to sign an NDA before speaking with any potential acquirer, including us. Discuss valuation expectations. This is often a tricky topic, but we believe in discussing this fairly early in the process. The reason is to ensure the owner and Fox Three are within "bargaining range." We don't think it makes sense to waste your precious time with information requests and phone calls if our expectations are dramatically different. We don't talk details here... just rough numbers. We ask: "what's the first digit and how many zeros does your 'number' have?" Preliminary information requests. In order to make a formal offer, we need some information. To be respectful of your time, we try to keep our requests to a minimum. But we do need certain pieces of information to develop an accurate offer that we can stand behind. Fox Three submits an offer. We will analyze the information you provided and develop a formal offer in the form of a Letter of Intent ("LOI"). The letter will outline our valuation of your company along with a proposed transaction structure. We will also include other important terms generally found in an LOI. Due diligence. If we agree on the valuation and terms in the LOI, the formal due diligence period begins. This generally lasts between 60-90 days, but can sometimes take more or less time depending on the speed at which we can get information. During this period, we will negotiate the Purchase Agreement. This is basically a VERY detailed LOI, outlining every aspect of the transaction. Closing. After the due diligence period is complete, and the Purchase Agreement has been negotiated, the transaction closes and the money is wired to your bank account! Post-close. We are very flexible as to what your post-close role is. After closing, we will work with you to ensure a smooth transition to your post-close role. This could be anything, ranging from a complete exit (where you ride off into the sunset!) to part-time ongoing involvement (either as an advisor/consultant) to remaining onboard full-time as a senior member of the management team or CEO.